Sanford Robinson Gifford, American, 1823–1880. Hook Mountain, Near Nyack, on the Hudson, 1866. Oil on canvas. Yale University Art Gallery. Click the image to enlarge it. 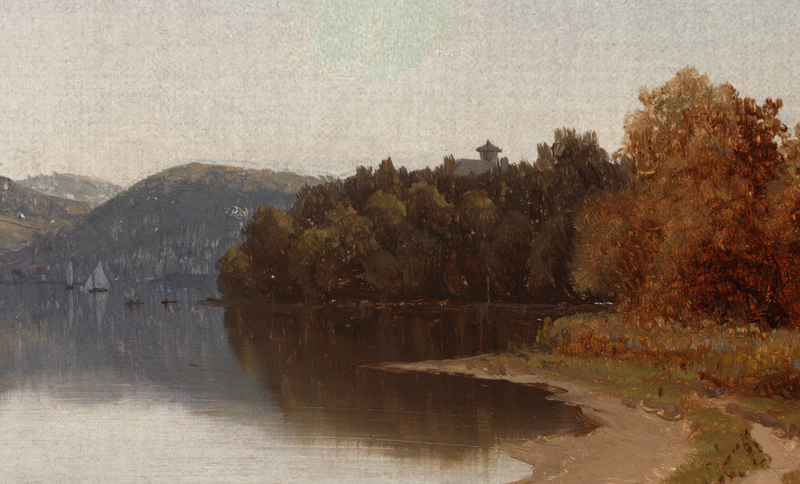 This magnificent Hudson River School painting, Hook Mountain, Near Nyack, on the Hudson by Sanford Robinson Gifford, shows the view looking west from the southern shores of Croton Point. Hidden in the trees in the foreground is the rooftop and cupola of Richard T. Underhill’s Italianate villa, which he built in 1846 and christened “Interwasser”. Detail showing the rooftop and cupola of the Underhill mansion on the southern tip of Croton Point. Click the image to enlarge it. For a similar view from higher up, showing the Underhill vineyards, see this previous post of a wood engraving from Harper’s Weekly.